On Thursday the Respect for Marriage Act is scheduled in the US Senate for mark-up. This is the act that would put an end to the Defense of Marriage Act (DOMA). It's amazing that DOMA has been found unconstitutional numerous times in Federal Court & yet our LGBT families continue to be discriminated against by this dated act. We have a chance in the Senate & less of a chance in the the House. Last week the GLAD (Gay & Lesbian Advocates & Defenders) filed a brief to the First Circuit Court of Appeal in Boston defending an earlier court ruling finding the federal "Defense of Marriage Act" unconstitutional. GLAD’s brief was in answer to an appeal brief filed by BLAG (Bipartisan Legal Advisory Group of the U.S. House of Reps) defending the law. Mary Bonauto, Civil Rights Director for GLAD stated, "BLAG doesn’t seem to understand that our plaintiffs are already married. They keep arguing against the right to marry & raising issues about why same-gender couples should be denied government marriage licenses. But the federal government doesn’t issue marriage licenses; states do & Massachusetts did. As a result, BLAG fails to justify why the Congress singled out one group of married people & denied them alone the same federal rights & responsibilities available to all other married people." 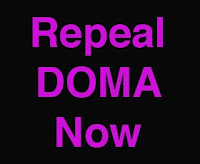 Sign Petition to End DOMA…..
DOMA is an enormous obstacle to equality for same-gender couples and their families, denying them key marriage benefits and imposing harsh, unfair economic burdens. They are deprived of crucial Social Security survivor benefits after a spouse passes away. They cannot file joint federal income taxes, and they cannot take unpaid leave under the Family and Medical Leave Act. Some couples are torn apart by the deportation of a non-citizen spouse forced to return to his or her home country. Because of DOMA, gay or lesbian service members – who finally serve openly, because we repealed "Don't Ask, Don't Tell" – will lose veterans spousal benefits, including the right of the spouse to be buried in a national cemetery. The law insists on treating lesbian, gay, bisexual and transgender Americans as inferior. The Respect for Marriage Act would erase this inequity by sending DOMA to join other discriminatory statutes like "Don't Ask, Don't Tell" and segregation-era policies. And Thursday's markup is a monumental leap in the right direction – a day when our allies and foes alike need to hear from us. I've been fighting for this legislation every day for the last eight months, and now we've reached this critical moment. I need your help in building momentum for this vital legislation. We need 50,000 signers in the next 48 hours. Sign HRC's petition now – it'll be delivered in person on Capitol Hill alongside thousands of other petitions.